Virgin Galactic's SpaceShipTwo makes its first solo test flight Oct. 10, 2010. After making its first solo glide flightSunday (Oct. 10), the private suborbital spacecraft SpaceShipTwo could achieveanother major milestone — a powered test flight involving the firing ofits rocket motor — in the next few months. "We at Scaled look forward to anaggressive flight test schedule," said Burt Rutan, founder of ScaledComposites, which built SpaceShipTwo. "The fun started on 10/10/10 andwill continue as we reach our goal of passing onto our customer[s] a spaceshipcapable to provide the space experience to thousands of adventurers." The company has been reluctant to set a hardtimeline for upcoming tests, emphasizing the provisional, flexible nature ofthe process. 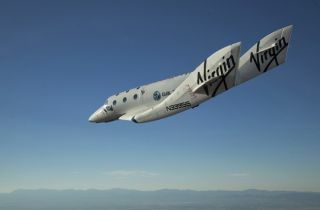 But whatever the specifics, Virgin Galactic is making steadyprogress in its testing regime, officials said. "Now, our challenge going forward willbe to complete our experimental program, obtain our FAA license and safelybring the system into service at Spaceport America, New Mexico," VirginGalactic CEO George Whitesides said in a statement after Oct. 10's glide-flighttest. SpaceShipTwoisdesigned to carry eight people (six passengers and two pilots) on suborbitalflights that would reach outer space for a few minutes before returning toEarth. The spacecraft will drop from a mother ship,called WhiteKnightTwo, from an altitude above 50,000 feet (15,240 meters) andfire a hybrid rocket motor to launch into suborbital space. This motor will usea solid rubber compound for fuel, which will be oxidized by liquid nitrousoxide. At $200,000 a ticket, paying passengers onSpaceShipTwo will experience weightlessness and glimpse the darkness of spaceand the view of Earth below. Virgin Galactic says 370 people have alreadyreserved a seat, with paid deposits totaling $50 million. Virgin Galactic has conducted extensiveflight testing already. WhiteKnightTwo has flown 40 separate times, carryingSpaceShipTwo on four of those flights, officials said. "The spaceship flew like a bird, and thecrew got out with big smiles on their face," said Virgin Galactic founderRichard Branson, shortly after SpaceShipTwo touched down at Mojave Air andSpace Port in California. "So I'm absolutely delighted." "[Pilot Pete Siebold] was able to justkiss the ground," Rutan said. "When you do that, and you've neverflown the airplane before, never landed it, what that tells you is you've got aphenomenally nice flying machine." When carrying paying customers, the mothership and SpaceShipTwo will launch from a site near Truth or Consequences, N.M.,called Spaceport America. The facility, the world's first commercialspaceport, is under construction, and it's nearing an important milestone ofits own — the Oct. 22 dedication of its two-mile-long runway. Spaceport America could serve many privateaerospacefirms in addition to Virgin Galactic. Companies such as Armadillo Aerospace,Lockheed Martin, Moog-FTS and UP Aerospace, which are each developing their ownspacecraft, have been working with Spaceport America officials to develop thefacility. Spaceport America is expected to be fullyoperational sometime in 2011, officials have said.